Have you ever taken a moment to reflect on your career? Not so much your work and accomplishments, but the people who played a role in shaping it. Some of them may be obvious — managers, mentors, peers. Some perhaps less obvious — authors, academics, activists. Have you told them what they mean to you? Do they understand the impact they’ve made on your career? 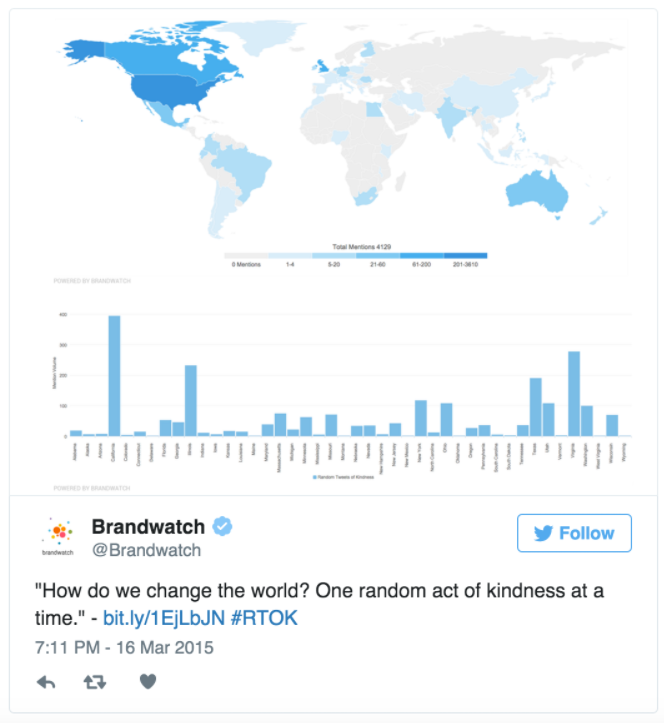 Random Tweets of Kindness (#RTOK) was launched in 2014. That year I left a corporate role running recruiting and innovation at NPR and launch my own firm — AMPLIFY//. I was amazed at how many friends from my network went out of their way to help me as a new entrepreneur. Full of gratitude, I decided to take a day to publicly recognize and thank people who’ve helped, inspired, or supported my career over the years. It was never intended to be anything beyond that, but then something interesting happened — it caught on. Others began recognizing people who’ve influenced them. By the end of the day, there were dozens of contributors — and a growing call to make it an annual event. 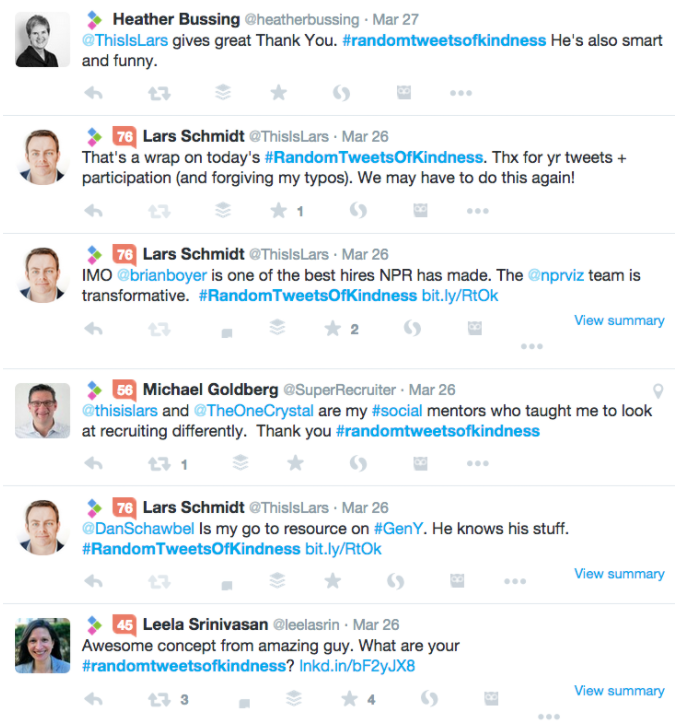 Random Tweets of Kindness returned in 2015. That year we promoted it in advance with a blog post. What happened next stunned me. Over 4,000 tweets from 35+ countries. #RTOK was trending globally on Twitter. I spent 17 hours glued to my computer as I watched the tweets of thanks and gratitude stream across my screen. It was lightning in a bottle. To be honest, it was all a bit overwhelming. I never intended #RTOK to be anything beyond that initial day of thanks. When I saw how it evolved, and more importantly the impact it had on others, it took on a life of it’s own. It had now grown into something bigger, and we continued the the initiative in 2016. This year #RTOK returns Wednesday March 8, 2017. We’re honored to share the day with International Women’s Day. RTOK has grown beyond Twitter — so use any channel (social or IRL) you think will have the most meaning for those you’re recognizing. You can also register here (not required). -On 3/8, send tweets, FB posts, Instas, Snaps, etc. 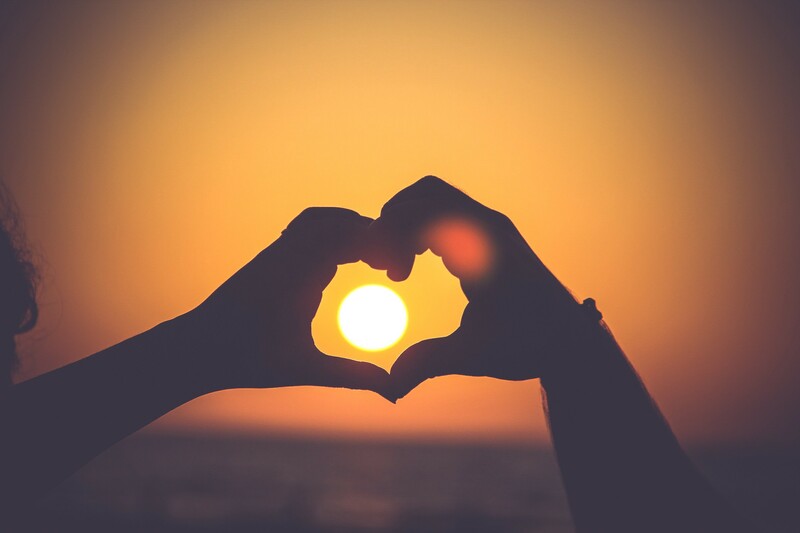 throughout the day to anyone you feel deserves recognition for their work — or just some kindness. Use #RTOK if it fits your platform of choice. I hope to see you all on the Twitters on Wednesday 3/8. In case I forget on Wednesday — thank you.